A. 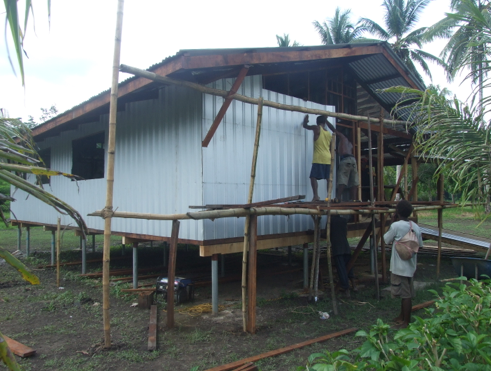 Completion of the Large Multipurpose building for classroom space/church and local meetings- This building will be used as a classroom to help in the literacy efforts as well as housing the local church. We are using the half that is completed every week for church service. 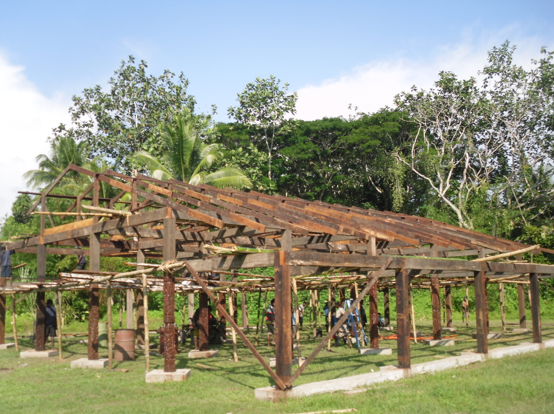 It has also been used for countless community gatherings and meetings. While we had a work crew come in 2010 to help with the first portion of construction, we still have not completed the last half. Most of the posts and beams have been milled and are ready to be set. One more milling trip and the timber will be ready!! B. Completion of Medical Clinic- We were fortunate to get the exterior of the new clinic in 2012 erected. A short work trip in December 2012- January 2013 put up some of the walls and ran the electrical wiring. 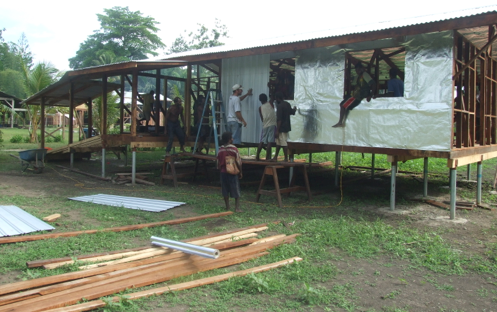 Just a few, time consuming tasks remain and we will be able to move the clinic, into the new building! C. Remodel for our House- With the addition of a new member of our OIPNG team (Rebecca Linsenbigler), we are planning to prepare a guest room and remodel our house to accommodate our growing children. After 35+ years of earthquakes and jungles conditions there are a few things structurally that need to be addressed. This is a big priority since there are few supporting posts in need of replacement, a bathroom tub that is rotting out, and a lot of wasted space that could we need to make use of. D. Staff Housing- Finally, housing for the clinic staff remains to be completed. Since a couple of the workers live 45 minute walk away, it makes sense to have a house where they could live to cut down on their “commute”. Especially when you consider that they are on call and the only medical assistance 24 hours a day, and the road is frequented by snakes at night. We’d rather the medical person be in good shape once they get to the clinic, rather than needing treatment themselves! Teacher’s housing for the elementary is also a possibility in the future. The provision of a house for teachers is customary as a part their wages similar to our “housing allowances”. The classroom is right across the street from the portion of land “marked” for staff housing. They also provide added security for the property.